A Magazine for Spiritual Upliftment. Woodhaven, Jamaica, NY. Publisher: Forerunner Printing & Publishing Co.
1/1, July 1927. 12 pp., $2.50 a year. This was the equivalent of a church bulletin for a small group of spiritualist churches around New York in the late 1920s and early 1930s. Primary among those featured in the journal was the Church of the Four Leaf Clover in Woodside, Queens. Its pastor was Rev. M.E. Claas, who had founded the church in 1925 and eventually guided its expansion to include four churches, and whose article lead off each issue. 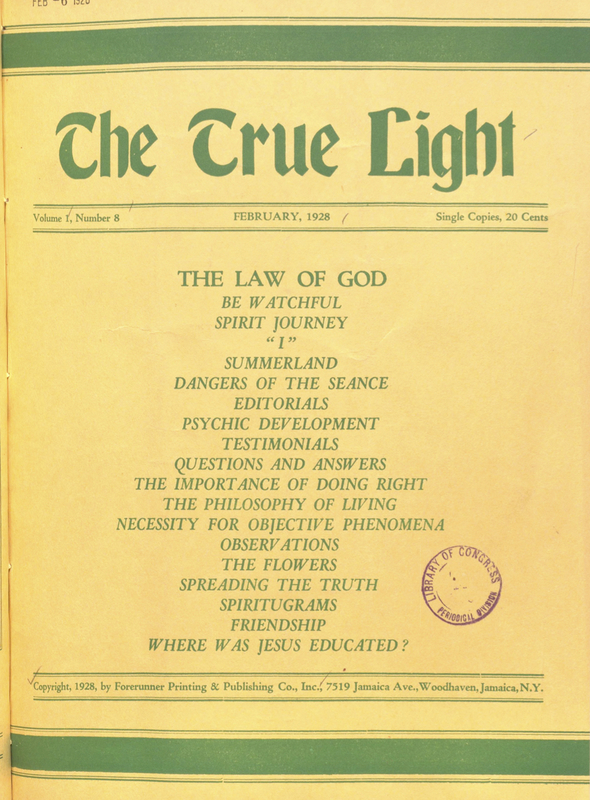 The group was Christian in the sense that each issue displayed the Ten Commandments and was replete with citations to the Bible (including regular "Spiritugrams," verses chosen from the Psalms with a challenge to identify the source), but prominently advanced its beliefs in spirit return, reincarnation and karma. Each issue had an article "through the Mediumship of Lillian Barit" and one on Psychic Development (by the Rev. Milicent Hubbard of Albany). The primary value of the journal lies in its contributors and in small number of advertisements in its pages that cast some light on this obscure period in spiritualism: the Alliance Christian Church in Boston ("Rev. Claude Spence, Minister and Psychic"), the Supreme Council Independent Associated Spiritualists, inc. ("Carolyn C. Duke, Supreme Councilor"), the Temple Brotherhood, Inc. ("Carolyn C. Duke, Mediator-in-Charge"), "All Students of Spiritual Science" ("My Special Letter of Instruction (printed) called: 'How to Enter the Silence,' mailed (sealed) for 50c in stamps"), Henry Lodge ("Will Serve Societies as Lecturer and Message-Bearer; Readings by Mail, $2.00; Absent Healing Treatments for Free Will Offering"), etc. If the journal was the work of the Church of the Four Leaf Clovers, it had a successor in the 1930s in Clover Light published by the church). LOC; Columbia University; Harvard University.